Recycling Bins of Paris, Where are you? On our first week in Paris we decided to go look for tickets for the weekend. We took a walk in the 2e. arrondissement up to the Place de L'Opera and Rue La Fayette. It is a 20min walk from where we are and after all the croissants, baguettes, crepes and wine we needed the walk. Since the building where we are staying does not provide recycling bins, we filled up a plastic bag with our recyclables and decided to bring the bag with us -- we were certain we would see a recycling bin somewhere along the way where we could deposit our items. We walked in the area for about three hours and the only two small bins we could find were totally full. We carried our bag of recyclables all the way and ended up bringing it back with us again; no bins to be found. Why is it so hard to find bins? The only place we have seen them are at children's playgrounds. Why would that be? It is good to have them there to teach the children to recycle, but have they given up on the adults? Well, let's see what I learn about recycling in Paris during our stay. After spending three days in London, we went to Saint Gallen, in Switzerland, east of Zurich. In the six days spent in St. Gallen, we went exploring the area where we were staying. The streets were very clean, and the parks were inviting -- there were many people on their lawns enjoying the weather, eating lunch, or simply reading books. We also saw lots of beautiful water fountains offering free fresh chilled water to refresh any thirsty passer-by. In the buildings I noticed something extra that shows that in Switzerland they understand the reasons for not wasting water: all bathrooms use dual-flush technology, a double-button mechanism for flushing the toilets. That way one button can be used to flush using less water and the other to flush using more water. In a test performed in Canada it was verified that water consumption is reduced up to 68% by simply applying this technology. It has been widely seen in Europe, but it is not as common in the US. At home, natural and fresh ingredients are what is mostly used. Some residents even grow their own fruit, vegetables and herbs in their own yard. Food gardening is very popular in the US too -- and getting more, and more popular each day according to the National Gardening Association latest garden market research. As Dawn.com reports, some families turned to home-grown foods for financial reasons but are sticking to it even after their difficult times have passed. In our case, we have just started our own food garden in our yard and are very excited about it, but we still have a lot to learn. In the meantime, it was a delight to have the opportunity of picking our own fruit and tasting some of that in the mountains, looking down at the city. What a beautiful place! However, I did not see any recycling bins that could be used on the streets or even at the hotel. I found the official site of the city with some information online, but only in German... After some more research, I came across a forum in English for Swiss residents that has a few discussions on recycling and garbage collection. There I learned that recycling is more commonly done by using collection points and just a few items are to be placed at the curb. Even then, those items that can be placed at the curb may have to follow a pick-up schedule, such as paper and cardboard being picked up only once a month. Also, depending on the location, residents may have to purchase official bags to dispose of their regular garbage; they pay for the amount they throw away. This pay-per-bag system has been on and off in many different countries, including the US. We do not have that in our neighborhood, but in Maine, for example, this option was being recently considered. All in all, even though I did not see much recycling going on in the city, I learned about their system and found out how recycling is done there. It is different, but that does not mean better or worse; maybe some ideas for us to consider in the future. For three days we walked around the city of London where new and old live side by side. London is definitely a beautiful city with lots to see. Besides historical places and beautiful parks, we did see some green trends in the city. The first one to catch my eye was the living wall being built outside the The National Gallery. Next to a billboard that reads "Bringing art to life as never before", a panel that shows a replica of Van Gogh's 1889 painting A Wheat Field, with Cypress was being built. I was happy to learn that the wall is now finished and it looks awesome! I only took one not-very-good picture of the wall, but I was able to find more pictures posted at http://freshome.com/2011/06/09/living-wall-in-london-mimics-van-goghs-painting/ According to The National Gallery's website, the panel will be at display until the end of October 2011. The replica just built was the first living wall created outside the National Gallery to mimic a painting, but London has other living walls in other spots of the city. Recently, the Mint Hotel near the Tower of London, for example, transformed its building's wall into the largest living wall in Europe. It is a very interesting concept of bringing some green into the buildings and large cities, but also debatable. The failure of the fist living wall of London built in 2006 for the Paradise Park Children's Center is an example that fuels the controversy of living walls being a questionable type of project. Something to keep in mind. Another thing I noticed that seems very popular in London is hiring bicycles to go 'round town. We see Barclay's Cycle Hire bicycles being used everywhere with many docking stations in different parts of the city. The docking stations are just 300 yards apart from each other, making the bikes very accessible and a convenient way to move around. The price is also inviting: just £1 (yes, only one pound that is about US$1.50) per day and the first 30 minutes are free of charge. The price can get even lower if we buy an annual pass or have their membership. A great green way for grown-ups to do some sightseeing for little money. And last but not least, I saw some interesting garbage cans that include recycling bins. The garbage cans are three-in-one containers that are used for recycling items (newspapers, magazines, plastic bottles, food and drink cans, glass bottles, and jars), cigarette butts and general litter. I was pleased to see that even cigarette butts could be properly disposed of by considerate pedestrians! We can find one of those bins in every corner and people seem to have adopted the bins quite well. At Pret a Manger, a restaurant chain in London committed to recycling, a different, more compact version of the three-in-one bins can be found in their store. I saw one in their London City Airport location. Those were the main things -- besides the lovely historical sights -- that caught my attention in the short time we spent in London. I like the three-in-one bins a lot. Maybe we could use some of those in our neighborhood too, hum? A week ago we set off on a trip to Europe. The trip will cover England, Switzerland and France in a way we have not done before. An amazing opportunity to learn about the different cultures, history and, of course, recycling habits. Europe is famous for coming up with innovative ways of doing things, improving what is there in order to do things better, more efficiently and in a more sustainable form. We see projects like the Bombardier's zero-emission PrimoveCity transportation solution emerging, being co-funded by the government and already available and being tested in Germany. And Germany is also home for the holder of the title of European Green Capital 2011. Hamburg accepted the title at an official award ceremony in February 2009 in Brussels and now the Hanseatic City is planning to travel around Europe with its visions for a green future to transform people into environmental protection enthusiasts. For this purpose Hamburg has created the Train of Ideas. In the UK, we read about packaging regulations that are in place to encourage businesses to reduce packaging and take responsibility for their impact on the environment. Information about recycling at home, at schools, and in the workplace is also made available to the public via websites like Recycle More, which also has a link to help everybody find recycling facilities in the UK. In England (Barclays Cycle Hire) and France (Velib) we see the trend of bicycle-sharing spreading and the practice of car-sharing, like City Car Club in England, also becoming very popular. It seems to me that in Europe being green and eco-friendly is just the way to be. Has the 6th EAP pushed Europe further into making changes to protect the environment in general? Has the EU Waste Legislation visibly achieved the results set for waste/recycling? We'll see. The reporting on progress occur frequently and according to the data available there has been some progress in a few countries. Other reports on more recent years should be able to show more, but they have not been published yet. All this sounds very interesting and I cannot wait to experience a little bit of it! I am particularly curious to learn how the recycling practices in the countries I will be visiting compare against what I am used to back home. So come with me in this little European adventure and let me share with you what I learn about other recycling practices. There are many cities and towns in Brevard County. Information on recycling may vary from one to the next and sometimes can be a little tricky to find. 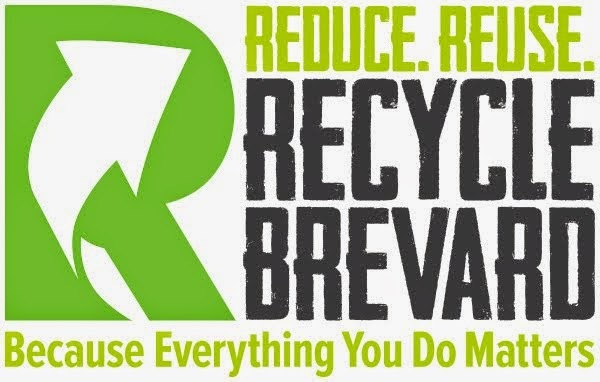 A good starting point to all is the Brevard County Solid Waste Management's website (http://www.brevardcounty.us/swr/). You should explore that site to find what you need. The Recycling Page has a list of what can be recycled and alternatives to what cannot be placed in the curbside recycle bin. If you still have questions, you can call the recycling line at 321- 633-2043 and also email them at sw.webmis@brevardcounty.us.